You've probably heard the terms RSS or RSS Feed or maybe you've seen the icon in use throughout the web. The history of the RSS feed coincided with the rise of blogging in the early 2000s. RSS quickly gained a foothold among tech-minded bloggers as a method of reading content in one place without the need to visit numerous sites daily. Through the use of a feed reader, a user could enter the URL of site's RSS feed, along with any other sites they commonly visited. The feed reader would periodically visit the feed throughout the day to see if there was new content. If it detected something fresh, it would automatically pull it in. It made keeping up with the news and bloggers an easy task. Your news feed, right where you want it, in a streamlined format using Previous and Next navigation. Perhaps the most well known Feed Reader was Google Reader, which really opened the door to the use of RSS feeds. Sadly Google Reader closed down in 2013, despite heavy usage, as it appears Google was never able to find a way to monetize Google Reader. 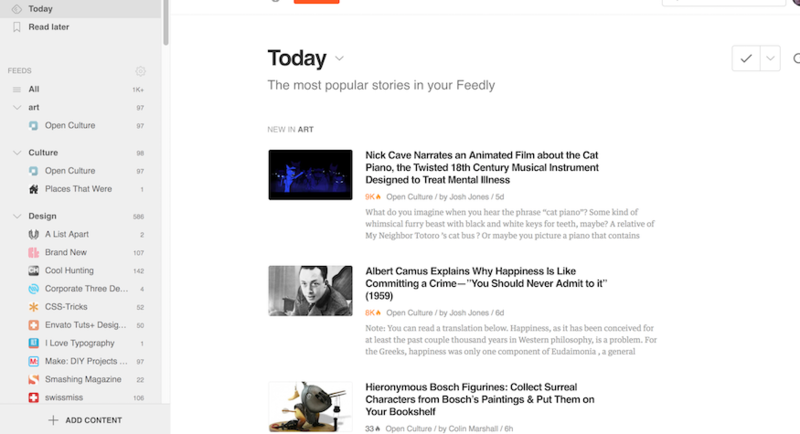 Today Feedly.com is one of the most popular, along with NewsBlur.com, InoReader.com and Feedspot.com. Additionally, there are numerous application-based readers as well including NetNewsWire for Mac and iOS [netnewswireapp.com], and functionality within the browser like Safari, Firefox, and Chrome (via an extension). I'm subscribed to over 150 different RSS feeds. But using a feed reader, it takes me only a few minutes a day to scan through the headlines. If I see something of interest, I will open it in a new browser tab for later reading. I also have additional tools which allow me to share something I like to my Twitter account. The beauty of RSS is that it frees you from having to read everything you subscribe to. Using keyboard shortcuts you can easily skip over items that aren't of interest. Writing a new blog post for your website? Use an automation tool such as Zapier or IFTTT (If This, Then That) to automatically grab the information from your blog post and push it out to your social media accounts. Compiling news or press releases for a multi-location business? Set up a dashboard tool to bring in current headlines or display company news on esignage without the need for rewriting a news story. Adding support for Facebook Instant Articles for your brand or website? Facebook relies on a customized RSS to create lightweight pages that load fast for mobile readers on slower connections. For the privacy conscious people among us, RSS also provides a layer of anonymity. 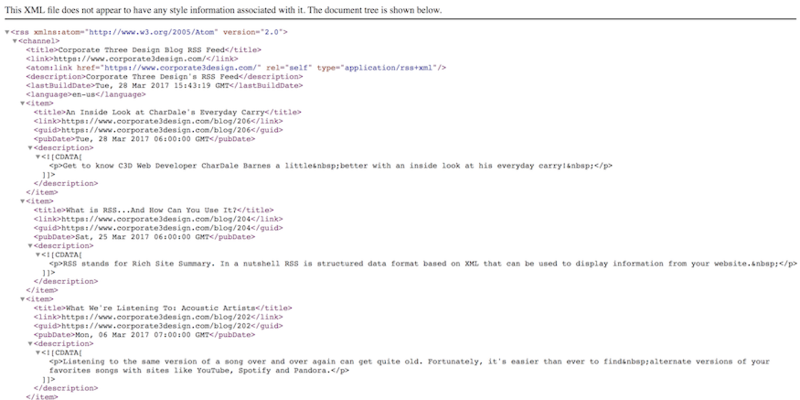 Since feed readers capture the data provided from an RSS feed. The websites you subscribe to will never see any personally identifiable data. What are you waiting for? Fire up a feed reader and subscribe to our feed.